The global economy is undergoing historic transformations as economic and political power continues shifting towards Asia. With a rising share of the world’s total GDP, the UK needs to ensure it achieves greater strategic access into Asia’s biggest markets, notably into India. 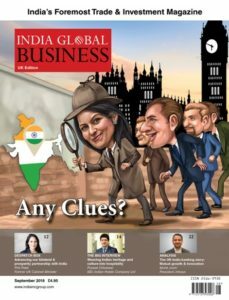 The importance of this preferential access cannot be overstated: as India is the world’s fourth largest economy with 1.2 billion people and a growth trajectory that presents enormous commercial opportunities for decades to come, deepening UK-India relations is crucial to securing our place as India’s business partner of choice. The UK’s work in India has seen some great achievements over recent years through targeting cooperation in areas that are most important to both India and the UK; the foundation on which to grow the UK-India relationship was strong. Which brings us to the future of new trading horizons, where Britain’s departure from the European Union (EU) presents a new opportunity to enhance trading links with our friends in India. It is a fact that while Britain remains in the EU and bound to EU rules on trade and tariffs, Britain and India cannot forge an independent strategic trade partnership. The EU controls UK trade policy and determines tariff and non-tariff barriers. These controls act as a serious restriction on the UK’s ability to increase trade flows between our two countries and the rest of the world. Barriers to trade erected by the EU remain firmly in place as the EU and the Customs Union act as a protectionist bloc designed to protect the narrow vested interests. The proposed India-EU Bilateral Trade and Investment Agreement is a classic example where protectionist interests have shown the EU’s lack of understanding of India and her own hopes and aspirations on world trade. The proposals for a free trade agreement were put forward in 2006 with negotiations beginning in 2007. Eleven years on and 16 rounds of negotiations later, a final deal is still some way off. The bureaucracy involved with a block of 28 countries with different priorities and interests trying to agree a united position has complicated matters. On top of this, during that time, the EU has put the securing of trade deals with other countries first and arrogantly abandoned efforts to address the matters preventing this deal being made. Rigid labelling requirements, restrictions on services and outsourcing and barriers to market entry for food and medicines are among the biggest restrictions put up by the EU. It is a damning indictment on the EU that they have neglected India and shown little respect to a country of the size and importance of India. 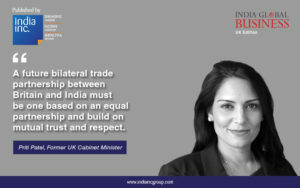 A future bilateral trade and partnership between Britain and India must be one based on an equal partnership and build on mutual trust and respect. India, especially under Prime Minister Modi, has shown itself to be an open and outward looking country, keen to take its place in the world as one of the great powers of the twenty-first century and committed to a programme of liberalising reforms. 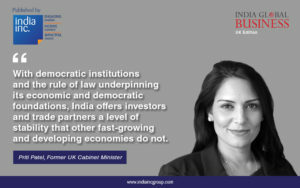 With democratic institutions and the rule of law underpinning its economic and democratic foundations, India offers investors and trade partners a level of stability that other fast-growing and developing economies do not. Unfortunately, there are too many in the British government focused on securing a post-Brexit trade deal with the EU at any cost, there is a risk that they are losing sight of the significant trade opportunities that the rest of the world offers, including India. By the middle of this century, the EU’s share of the global economy will be less than 10 per cent, having fallen to just a third of its level thirty years ago. Fast growing economies like India and emerging markets offer Britain a great opportunity to boost global trade flows and increase jobs and prosperity in Britain and with those counties we trade with. Our future lies with closer partnerships with the rest of the world and not being bound into the EU as its power and influence diminish. By the middle of this century, India is set to be the world’s third-largest economy, with the largest working age population of any country. This growing market of consumers is supplemented by a healthy entrepreneurial spirit giving India over 36 million micro, small and medium sized businesses. With our shared history and language, and the strong connections that over one and a half million Indians living in the UK provide, the British government should be prioritising trade with India. To be frank, over the last few years not enough serious focus has been given by the British government on building upon the significant bilateral relationship established between our two nations during the Cameron era. For this to change, a more open and equal bilateral partnership must follow covering every aspect of Government policy ranging from home affairs, the environment, defence and the economy. British diplomats and politicians seem to judge success on visits and meetings with officials rather than the actual ability to find ways to advance relations based upon mutual recognition and interest. India has no shortage of potential partners, so the UK must act to ensure that we are India’s partner of choice. Our current levels of bilateral trade should be higher and that must be a priority for the British Government. In 2016 Britain exported £5.7 billion worth of goods and services to India and imported £9.7 billion. There is significant capacity for growth and an acceleration in trade as we leave the EU and if the British and Indian governments can agree a comprehensive free trade deal quickly. There are a wide range of sectors where the conditions and expertise our two countries have created good conditions for trade growth and more partnership working. These include technology, engineering, advanced manufacturing, IT, infrastructure, medicine and scientific research and development. But while governments can lay the foundations or trade, the deals that create jobs and prosperity are done by businesses and entrepreneurs themselves. A new trade deal with India will help existing trade forums that exist between Indian and UK businesses – such as the CEO Forum and Joint Economic and Trade Committee. However, while those high level corporate connections between big businesses and multinationals are important and have already delivered jobs and prosperity, an India-UK trade deal must facilitate trade between our two countries’ micro, small and medium-sized businesses. With 36 million such businesses in India and 5 million in the UK there are huge opportunities for those firms to rise to the challenge and strengthen relations between our two countries. Our economies are built on the successes of small businesses and entrepreneurs and a long-term and deep trade and partnership agreement that brings together businesses of all shapes and sizes. Our unique connection is underpinned by a deep, mutual understanding of each other’s cultures and by our shared values. The UK must move into the era of stronger bilateral relationships and ensure that the shared interests binding our two Great Nations together delivers a shared glorious future for us both.